The Pursuit of Now was part of the Buta Festival held in London, celebrating Azerbaijani arts. 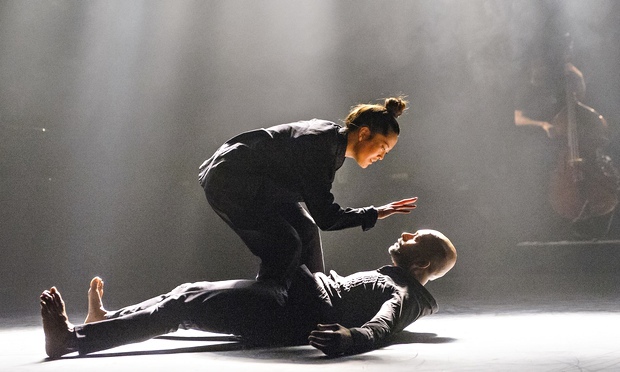 The performance featured Akram Khan, a celebrated contemporary dancer, his movements improvised to the music of renowned jazz pianist, Shahin Novrasli. Akram Khan was joined on stage by dancer Honji Wang and our pianist, Shahin Novrasli, was joined by Nathan Peck on the bass, Ari Hoenig on the drums, Arslan Novrasli playing the tar (a long necked lute) and another musician, unnamed in the programme, bizarrely, playing a stringed instrument played with a bow. The programme also names a vocalist, who never appears on stage. The show is introduced by Nasib Piriyev, who is the Buta Festival director. Despite the fact that the theatre is barely half full, he is palpably nervous. And also fifteen minutes past the 7.30pm start time. He stammers through his introduction and then the lights go down and the curtains go up. My heart is filling with dread and I am already planning my escape route when Shahin Novrasli starts to play. The sound is haunting, flowing and gentle. The dancers, Kahn and Wang begin to move: they are representing lovers, perhaps, and one seems to have dominance over the other but then the power shifts and the other has control. It is very moving and raw. Kahn moves as if he has no bones, he is thrilling and beautiful to watch. Wang’s style is less fluid, more robotic and it seems out of place set to this music and partnered with Kahn. She is clearly very talented but it’s all wrong here. Then the dancing and the music are over. Onto the stage step the bass player, Peck, and the drummer, Hoenig, to join Novrasli. The music they play is excellent; they are clearly talented. They are perfectly in time with each other and respectful of each other’s sounds. Hoeing plays the drums as if he is following a recipe, as if each beat is asking to be played. Similarly, Peck holds the bass as if it is whispering to him, telling him what to do. It is intoxicating to watch. Novrasli is hypnotising: at times he stands awkwardly, whilst still playing; at other times his knees and feet jerk up and out erratically. It is as if the whole of his body is trying to run away from his arms, which he holds stiffly away from his body as he plays. It was quite surreal. Soon the band was joined on stage by the tar player, another Novrasli, and our unnamed mystery man playing the stringed instrument. This was my favourite part. The sound of these exotic instruments in conjunction with classic jazz instruments was other-worldly. The sound was so evocative, of jungle sounds, birds, of something magical, like a scene from Midsummer Night’s Dream, of so many different things. It was truly wonderful to listen to. This section was all too soon over but the music continued to be mysterious and powerful. Wang and Kahn each danced solo pieces. Kahn is fascinating to watch, his limbs are so fluid that he doesn’t seem human when he’s moving. The entire performance, the musicians and the dancers, had an unnatural feel: at times the music was tantalisingly familiar but then it would drift off into a sound that was so distinctly “other”. It was absolutely brilliant – the music was so lovely, and if I can say that, me, the jazz-hater, then it must have been good!